English Medusa = Greek mythology. Yesterday afternoon we took a nice long stroll along our favourite beach. It was a beautiful hot spring day and we enjoyed it to the fullest. On our walk back my husband noticed a jellyfish on the ground and I just had to snap a photo. My husband has told me his horror stories as a boy being stung by a jellyfish. His body was covered with welts that lasted over a year. He survived. Last year a 69 year old woman from Cagliari was swimming in Porto Tramatzu in the comune of Villaputzu when she was stung by a jellyfish. She was able to walk out of the ocean to call for help, but moments later she collapsed on the beach and died from cardiac arrest. Every year I hear stories of people being stung by a medusa/jellyfish. Every year I see people coming out of the ocean shrieking in pain. 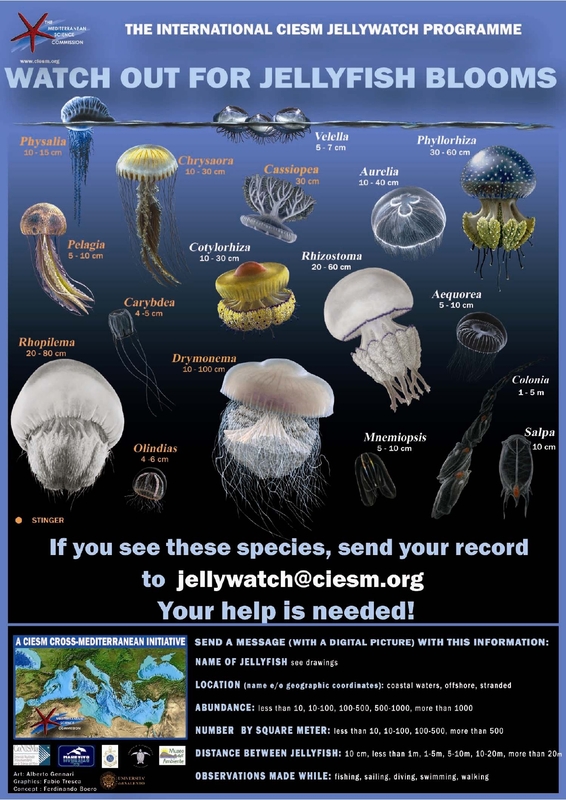 I found this reference chart by The International Ciesm JellyWatch Programme which outlines the various types of Medusa living in the Mediterranean. Are there other swimmers in the water? Do you see people coming from the water shrieking in pain? Can you see something floating peacefully in the water? Maybe it’s just a piece of plastic but maybe it’s a MEDUSA. 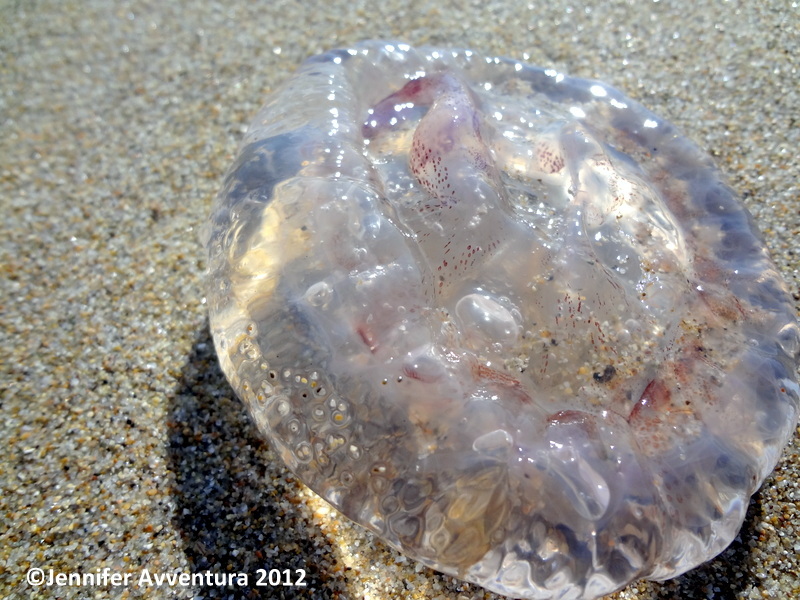 Have you or someone you know been stung by a jellyfish? Tell me your stories below. Wow, I’ve never heard of that method. I’ll have to keep a razor in my beach bag. Thank you. Hi we was in Italy last week and my daughter got stung we convered her ankle is sand for a about ten minutes she still has the marks around her ankle looks like 3-4 lines which are raised and swollen and red we don’t know which type of jelly fish however . I have been stung many times by jellyfish, but one occasion stands out vividly. About six years ago I was swimming in a river baths that runs into Botany Bay, and unfortunately collided with a red jelly blubber. I had never seen a red one before, and i never want to see another. My husband concluded that it had been brought in through ballast, and this theory was verified by others with expert knowledge of such things. Anyway, the pain was horrible, and I ended up getting abnormal heart function for a few hours afterwards. The welts faded after a few weeks. Thankfully, that’s the last time I’ve been stung: and believe me, it was the worst. In Canada we have jellyfish too! I remember as a kid seeing them washed up on the beach of the Atlantic Ocean. The water was too cold, so we rarely swam there. Just walked the shore. Another time we were in a bay and I waded up to my knees and almost walked into a small one. It was almost invisible, but a thin outline made the body just visible. I quickly exited! In Cuba we went to a reef to snorkle and the guide wouldn’t let us in the water because dangerous jellyfish were spotted. He said we would die before we got to hospital if stung. Many were disappointed, but I wasn’t taking any chnaces. One was on the beach and I snapped a photo… that was close enough. I grew up on Lake Ontario without Jellyfish! Just lots of trout and garbage! and gross algae! I grew up along 40 Mile Creek and Lake Ontario too! I remember all the gross algae some summers so no one wanted to swim there. Not that you wanted to swim in the lake anyway since it was so cold. Just in case, remember to always bring with you a s.o.s. stick, it’s most commonly made of “ammoniaca”, but it’s also available on a 100%organic base (chroton lechleri), wich really helps in healing fast in case someone gets stung! And it’s helpful also for bees bites! Great tip Sara, thank you! Do you know where I can buy one of those? Auchan?? I sell them in my shop, i can check of there’s some shop around you that sells it! 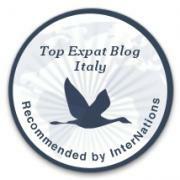 No, no auchan or great malls, you can find it only at organic shops…. Great thank you! I’d love to visit your shop, but I think you are very far from me. Jennifer, I’m still loving the feel of your new blog design. It is so crisp, fresh and easy to read. I am very afraid of jellyfish. My best friend was diving and was stung by one big one. She came to visit me three weeks after the sting and her legs and arms were still covered in welts. But I have to say they are quite beautiful! Great post! It feels like I have a brand new shiny car with this new theme. Im glad you are liking it, it was a tough decision to make but Im happy I did! Very educational – and fun – post, Jennifer! A perfect post for Summer. Much as we enjoy the beach , we need to be cautious. My friend’s daughter got stung two weeks and the jellyfish did some damage to her daughters arm. She’s still healing. I felt lucky in a way cause my son and I love the beach and so far we have not encountered a jellyfish and its potential dangers. I’m glad your friends daughter is doing ok. Sometimes we don’t realize the potential danger in the warm inviting waters. Jellyfish stings can lead to death and/or serious scarring. Informative post, thanks. I’ve never been stung, and I’ve only seen jellyfish on the shore. I will look before I leap in the future! I’ve always thought jellyfish were fascinating–from a distance! Great post! I was stung by a medusa in Positano a few years ago, it hurts! I photographed some huge Rhizostome yesterday at Forte dei Marmi. The see was full of them, but it didn’t stop people jumping off the pier into the water. Goodness, I wouldn’t want to be stung. But how fascinating language is. A friend and I were both stung a few years ago. I remember swimming and then looking over and seeing her run out of the water screaming. So I went back to shore to see what was up. I could see a huge rash developing on her back and side. Then moments later I could feel a sting on my leg and arm. She got it way worse than me but that sting hurts a LOT. We stayed out of the water for a bit but did venture back in later. Was the atlantic ocean though. I’ve been lucky and have never been stung by a jellyfish (rubs large wooden kitchen table for luck) but I know plenty of people who have. My husband recounts his sting story in horrific detail and pain. He was young when it happened and and he said the scars just dreadful! Only once have I been snorkelling in the Med and suddenly been freaked by jellyfish everywhere. I didn’t follow your first rule. I got out – and have never gone back in. PS. Love your new header ! Nougat ? Or whatever that lovely Italian cake is that I forget the name of. Oh…the torrone! Yes, it’s awesome! I’ve always been drawn to the ocean and have always looked to others first when deciding to jump in the water. Like you I get freaked out by natures creatures and prefer to keep my distance. The name “medusa”, which we associate to the jellyfish, is because Medusa had her head covered by snakes, and snakes bite and hurt, just like jellyfishes 🙂 I’m from Sardinia and love your blog!